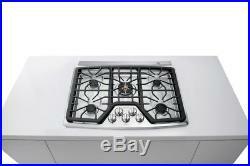 Frigidaire Professional 5 Burner 30 Stainless Steel Gas Cooktop FPGC3087MS. Fits-More cooktop features five burners so you can cook more at once. PowerPlus® FullRange burner goes from a 500-BTU simmer to a 17,000-BTU boil quickly. Low simmer burner is perfect for delicate foods and sauces. Heavy-duty grates and professional style knobs add style and function to your cooktop. Pro-Select® controls gives you precise cooking temperature control of every burner. Continuous grates make it easy to move heavy pots and pans between burners without lifting. 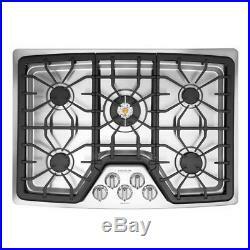 Stainless-steel recessed cooktop contains spills for easy clean-up. Depth (IN) 21.75. Height (IN) 4.25. Width (IN) 27.25 – 28.50. Depth (IN) 19.13 – 19.75. Minimum Clearance Above Cooktop in. Minimum Clearance Below Cooktop in. Minimum Clearance to Front of Counter in. Minimum Clearance to Left Wall in. Minimum Clearance to Rear Wall in. Minimum Clearance to Right Wall in. Cooktop Control Location Front. Gas or Electric Gas. Power Cord Included Yes. Color Family Stainless steel. Color Matching Controls Yes. Burner Configuration 1 – 17000 BTU, 1 – 12000 BTU, 1 – 9500 BTU, 1 – 7500 BTU, 1 – 5000 BTU. Cooking Surface Gas: sealed burners. Installable Over Oven Can install over oven. Cooktop Surface Stainless steel. Cooking Bay Style Fixed Bays. Our Carriers deliver Monday thru Friday. No Weekend or Holiday deliveries. This means, quite literally, that your items will be delivered to the curb in front of your home. It does not include moving the item into your home, garage, or other location, nor does it include any type of installation. The item will be considered a return. DO NOT SIGN FOR THE PRODUCT WITHOUT INSPECTING IT FIRST! DO NOT assume your product is not damaged if the box and/or packaging are intact. It is important that you open the package and check for concealed damage before you accept the merchandise. Red Tag Appliance is not responsible/liable for any damages discovered after the item(s) has been signed for and accepted. You must repackage the product in its original packaging. Item would need to be picked up at the same location as the item was delivered to. Red Tag Appliance strongly recommends that you DO NOT schedule a private contractor until after you receive your order. We advise that any installation be scheduled AFTER the item has been received and inspected. ACCURACY IN: PRICING, AVAILABILITY AND GENERAL INFORMATION. Red Tag Appliance makes every effort to ensure that the information is accurate, complete and current. Despite our efforts, occasionally there may be instances when information about a product contains inaccurate or incomplete data including data about the products price or availability. We reserve the right to correct errors and/or update the content at any time without notice. Red Tag Appliance also reserves the right to refuse or cancel any order containing any error or inaccuracy. To ensure you have the most accurate data possible, please use the manufacturers website as a final decision making tool. If we cancel an order due to inaccuracy, availability or general error issues, you will be notified within 48 hours. A credit will be issued after the item has been received and inspected. The customer has 30 days, from item receipt, to return any item, provided it is: unused, hasnt been installed and is still in the original packaging. We usually respond within 24 hours on weekdays. Thank you for visiting our. Features Fits-More™ cooktop features five burners so you can cook more at once PowerPlus® FullRange burner goes from a 500-BTU simmer to a 17,000-BTU boil quickly Low simmer burner is perfect for delicate foods and sauces Heavy-duty grates and professional style knobs add style and function to your cooktop Pro-Select® controls gives you precise cooking temperature control of every burner Continuous grates make it easy to move heavy pots and pans between burners without lifting Stainless-steel recessed cooktop contains spills for easy clean-up Specifications Dimensions: Width (IN) 30 Depth (IN) 21.75 Height (IN) 4.25 Cutout Dimensions Width (IN) 27.25 – 28.50 Depth (IN) 19.13 – 19.75 Height (IN) 8 Minimum Clearance Above Cooktop in. 30 Minimum Clearance Below Cooktop in. 6.5 Minimum Clearance to Front of Counter in. 2.25 Minimum Clearance to Left Wall in. 9 Minimum Clearance to Rear Wall in. 2.5 Minimum Clearance to Right Wall in. 30 Controls: Cooktop Control Location Front Power Source: Gas or Electric Gas Product Includes: Power Cord Included Yes Color: Color Family Stainless steel Color Matching Controls Yes Configuration: Burner Configuration 1 – 17000 BTU, 1 – 12000 BTU, 1 – 9500 BTU, 1 – 7500 BTU, 1 – 5000 BTU Cooking Surface Gas: sealed burners Installable Over Oven Can install over oven Number Burners 5 Certifications & Ratings: ADA Compliant Yes CSA Listed Yes NSF Listed No Weight: Item Weight lbs. The item “Frigidaire Professional 5 Burner 30 Stainless Steel Gas Cooktop FPGC3087MS” is in sale since Thursday, September 6, 2018. This item is in the category “Home & Garden\Major Appliances\Ranges & Cooking Appliances\Cooktops”. The seller is “redtagappliance” and is located in Niles, Michigan. This item can be shipped to United States.